Welcome to 50 Pope’s Quay, one of the oldest houses in Cork City. Since 2006 Civic Trust House has been home to a number of non-profit arts companies. 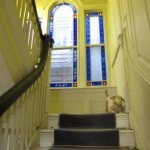 The house is provided by Cork City Council and at present 8 arts companies have their offices in the building. The house has a building manager who is responsible for services and facilities as well as providing reception. The resident companies work independently, often in very busy offices. With about 25 staff in total working for the companies in the building it is a hothouse of skills, information and creativity. Sharing knowledge, insight and advice is a part of every day at Civic Trust House. The kitchen is one of the most productive rooms in the house! Like to know about the house’s history? Interested to know what facilities are in the house?